The Native Americans, the franciscians, and spanish soldiers lived at my mission. The franciscians told the Indians what to do. The California Indians did many jobs including farmwork and building. The Indian children went to school to learn the catholic religion and spanish language. At sunrise, a bell rang to signal church services were starting. 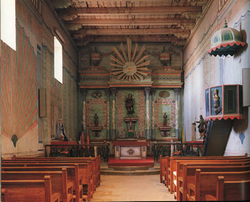 The California Indians and catholic preists attended mass. After church, the Indian adults went to work. The people at my mission grew wheat and grain. The Vacha lived in my region.They did not adapt very well to the mission system. They were whipped when punished then locked in the stocks.